Through our initial focus on providing consumers with efficient, organized, and high quality digitization at the best value nationwide, we've developed specific offerings that meet the quality requirements of professional archiving while maintain the prices enjoyed by consumers everywhere! Our large volume processes are specifically catered to 35mm & 120 format film - 35mm negatives (all formats, all film types), 35mm slides (all formats, all film types), and 120 format positives / negatives (all formats, all film types) can be captured at stunning resolutions (120 format 6x6cm film produce JPG files of approximately 6000 x 6000 pixels!). 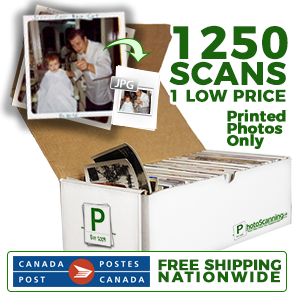 Various levels of government, national broadcasters, small museums, multi-national corporations and educational institutions have all trusted PhotoScanning.ca's expert scanning staff to outsource their digitization projects from single slides to hundreds of thousands of meticulously organized & catalogued items - all at Canada's guaranteed lowest prices. We are constantly innovating our process - shaving seconds off of scans can save pennies per negative - which equates to serious savings over the course of your project. Our in-house developer utilizes 3D Printing technology to custom design & print on-site custom gates & carriers specifically for your order. Our standard consumer offerings are focused specifically on providing a quality scan at the absolute lowest price - our offerings to our large volume clients are specifically catered to represent the stringent quality, file size, and file type requirements of a professional archival process. We're happy to build a price & process that meets your specific needs, or give suggestions & samples on varying levels - we typically quote & sample orders with 3 ranges - our consumer level offerings (8¢ to 31¢), professional level (60¢-80¢ - 35mm), and archival level ($1.00-$1.75 - 120 film) - Price ranges are based on general order configurations over 100,000 items. We would love to explain how our process can help save your organization time & money - we're not a typical sales company with high pressure tactics & commissioned sales - we'll give you our honest recommendation on your project, even if that answer is to stay & scan in-house or use one of our competitors. Reach out today and take advantage of our complimentary sample offer.